With executive focus on shoring up the commercial side of their payer mix, many health systems are being stealthily outflanked on a hefty portion of their revenue base long taken for granted: Medicare. Migration of beneficiaries into Medicare Advantage (MA) plans is accelerating rapidly in many markets nationwide: MA has grown by a whopping 71% since 2010 and now covers one-third of all Medicare beneficiaries. Sg2 expects this growth to continue, making the program a significant revenue source for many organizations. 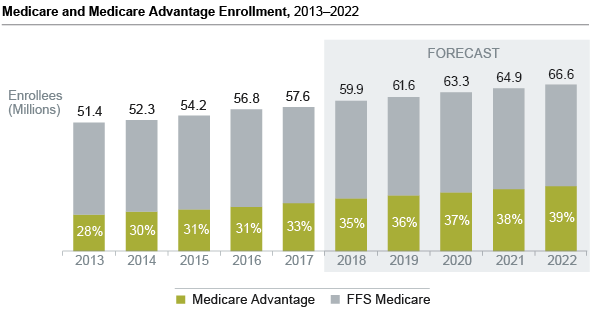 Medicare Advantage enrollment growth has been driven by demographics, consumer choice and a host of other factors. Medicare Advantage is not the managed care of the 1990s. Most Medicare beneficiaries have access to many MA plans, including HMOs and PPOs; market competition provides consumers an array of options at a lower price compared to FFS Medicare; and CMS’s transparent quality ratings (the 5-point MA star rating system) incent MA plans to maintain high quality—and help consumers judge plan quality. With roughly 10,000 people aging into Medicare every day, those already in managed care plans are likely to be comfortable transitioning to MA. For those not currently in managed care, the program’s lower premiums and out-of-pocket costs, as well as the extra benefits that many MA plans offer, such as dental and visual coverage, are big draws. Although its main focus was physician payment, MACRA included a change to Medicare Supplement (or Medigap) plans. MACRA phased out the popular Medigap plans C and F, which are the only plans that cover Part B deductibles, for new Medicare enrollees beginning in 2020. MA, with its competitive premiums, will look attractive compared against the combination of FFS Medicare and remaining Medigap plans. As of 2014, Medicare accounted for 35% of the hospital payer mix. With the aging of the population, that percentage is headed upward. A rapidly expanding segment of Medicare, MA enrollment has risen by 48% in the last 5 years. Sg2 expects this growth to continue. As a result, the significance of the program as a source of hospital revenue will continue to grow. With the need to focus on Medicare Advantage established, where should organizations begin? In setting strategy, health systems must understand 2 key aspects of the market environment: the current MA penetration as a percentage of Medicare and the growth of MA. These 2 statistics vary widely. Across the country, MA penetration ranges from 0% to 65%. Growth rates span from a negative 98% to a whopping positive 1,300%. Plotting MA penetration and growth metrics can help an organization understand where its market resides and, consequently, help executives craft an effective strategic MA approach, from which a wide variety of tactics are possible. The key is to tailor responses to the market conditions and organizational capabilities. Medicare Advantage: Too Big to Ignore can serve as a guide to the strategic options and tactical steps members can undertake as part of formulating their MA strategy. Once market potential and direction are understood, assessing organizational capabilities comes next. In a future entry, we will share learnings from the organizational assessments that Sg2 has facilitated with members. So, what is your organization doing to respond to Medicare Advantage growth in your market? When it comes to Medicare Advantage, the earlier you prepare the greater the returns. Sg2 members have a wealth of resources available to help craft the right MA strategy for their markets, shown below. Is your organization not a member yet? Contact us today to learn how Sg2 has become the strategic trusted advisor to hospitals and health systems nationwide.